This is the second-best thing in the world. Or part of the best thing in the world, I haven’t decided. 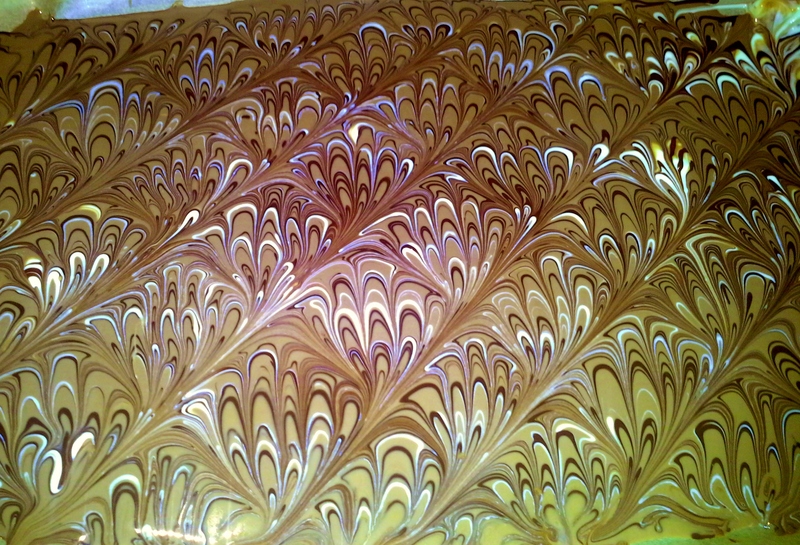 Anyways, the handmade papers I’ve shown you so far have all been marbled on a glue base. These are paste marbled, which is another thing entirely. It’s even easier, for one thing. To start with, I made paste from wheat flour and water, thinner than I normally use. I mixed it with pigment powder, but any kind of paint works to mix in. I should also mention that before starting this, we had covered the whole room in plastic. 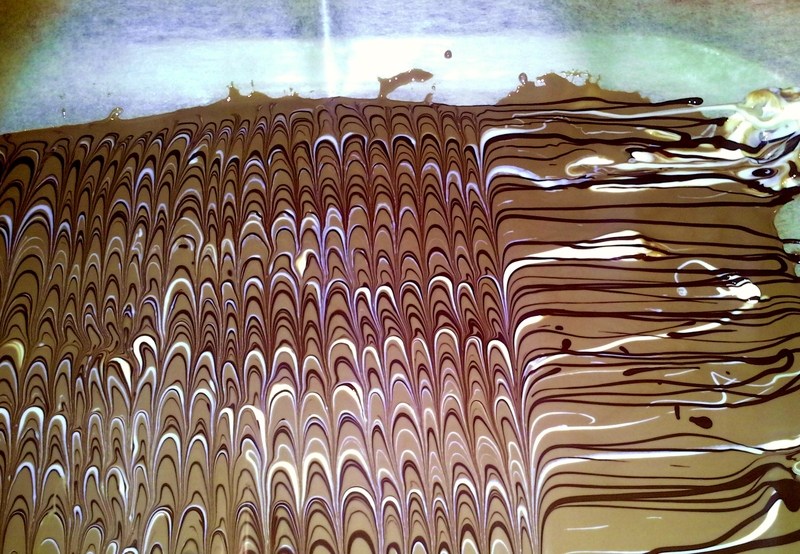 Paste marbling gets messy. I sprayed the paper with water and let it swell a while. If you don’t do this, it’s going to swell when you put the paste-paint-mix on, and get all wrinkly. I painted it with the colors I wanted. Then the fun part started. Using all kind of tools, from a plastic thingy used when tiling walls, to pieces of string, my own nails, tape and a small toy car, I made patterns in the paint. There really are no limits to what you can do with this technique – just remember to spray the paper with water every now and then, or the paste will dry too early. 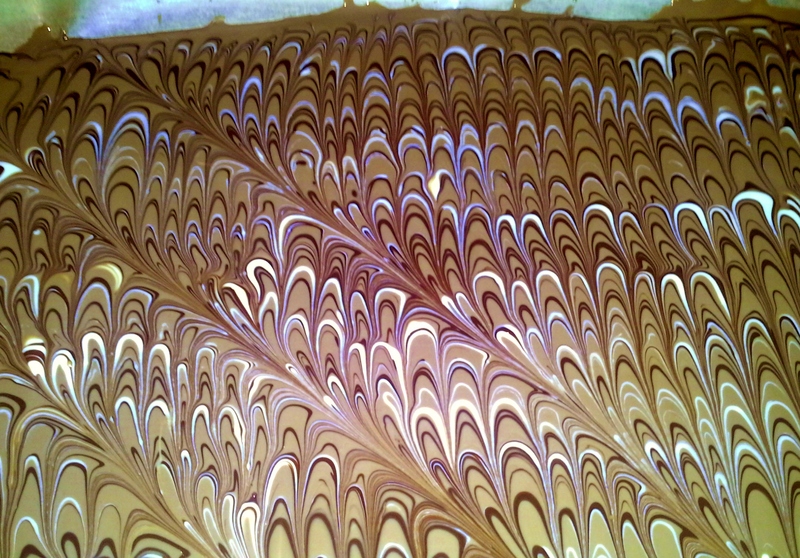 Remember that thing I said about marbling? Because I do. All the time and everywhere, I said. 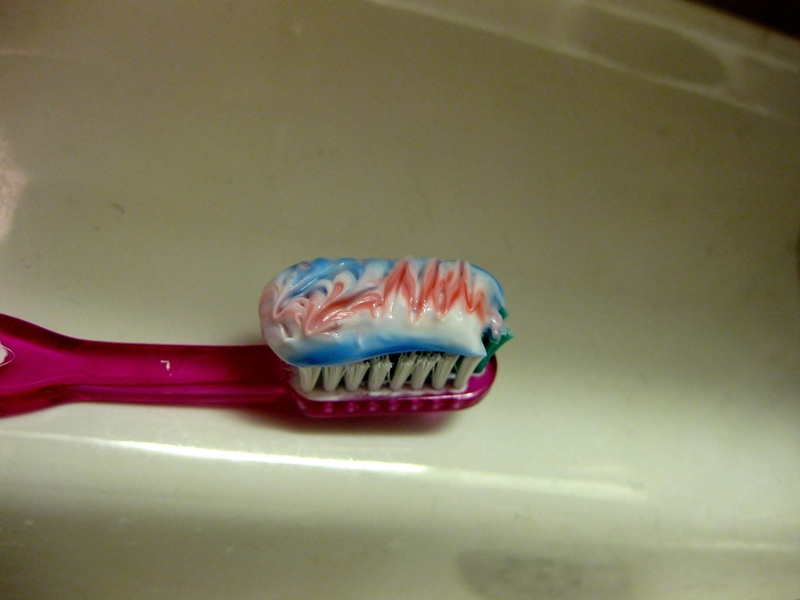 Every night for the past week when I’ve been preparing for bed, I’ve thought about how the striped toothpaste might possibly… and then I start brushing my teeth, because when you rise at 04:30 in the morning, you’re too tired for that sort of things. But yesterday I got fed up with just thinking about it. 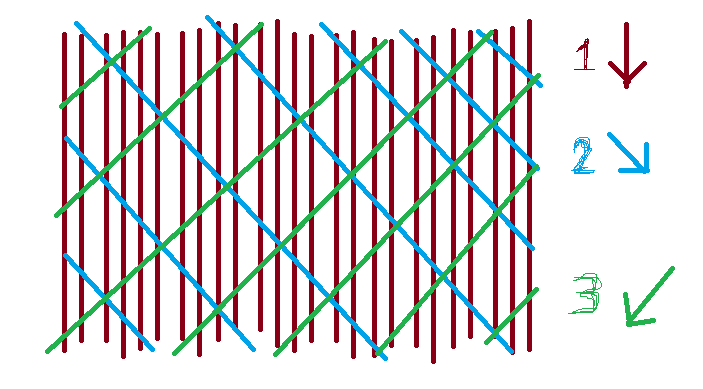 I used a toothpick to make some kind of fan pattern (on the left) and some sort of double comb pattern (on the right). And then I brushed my teeth and went to bed (one and a half hour too late). Posted in Uncategorized and tagged arts, awesome, how does your mind work?, marbling, possibly a bit too nerdy, real life, why am I so tired?